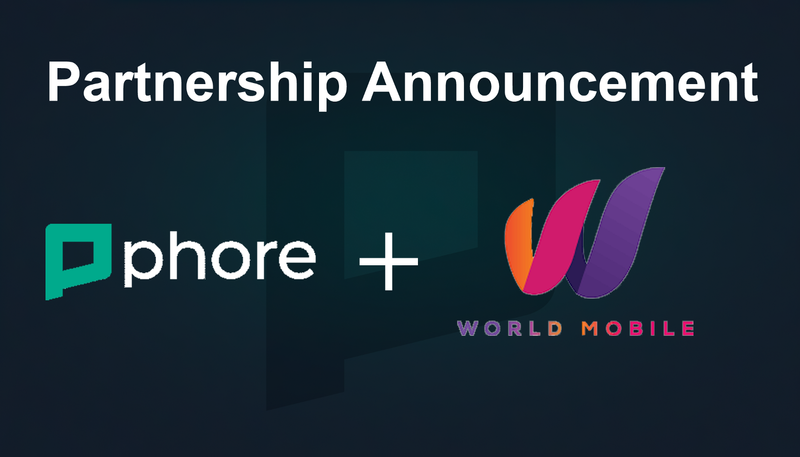 London, England, December 12, 2018 — Phore Blockchain, a leading blockchain platform and ecosystem focused on real-world use, announces a partnership collaboration with World Mobile, the world’s first blockchain telecommunications company. Phore Blockchain and World Mobile have agreed to work together to develop blockchain-based telecommunication solutions to benefit everyday users with low cost domestic and international calls, which also provide transparency and security. As a benefit, users making payments with the Phore ($PHR) digital currency will enjoy a 10% discount on calls on the World Mobile network over any other traditional or digital currency, or alternatively receive 10% more calling time. In addition, Phore SIM cards with worldwide functionality, powered by World Mobile, will be sold on the Phore Decentralized Marketplace. Also, secure P2P telephony services will be brought to both the Phore Wallet and Phore Marketplace, in order to increase functionality and aid transactions between buyers and sellers. A limited edition Phore mobile phone is also in early development, which will run on W-OS, World Mobile’s operating system. This will be a non-SIM model that eliminates roaming by automatically connecting to the best value operator wherever you are in the world. Phore Blockchain and World Mobile have identified developing markets in Africa, Asia and Latin America where telecom rates have been kept artificially high, stifling innovation. Both organizations are committed to stimulating significant growth in these areas with World Mobile’s network providing high quality, low cost calls and data services, along with Phore’s fee-free Decentralized Marketplace to sell their products and services. Phore Blockchain enables the transfer of value across an accessible, standardized ecosystem, which is secure, flexible and scalable. The platform supports a variety of applications, ventures and a growing range of capabilities, including reliable and fast transactions that are either transparent or private, rewards for network participation, a decentralized marketplace and Phore Synapse smart contracts. Phore Blockchain also offers custom blockchain technologies and services for B2B clients. Learn more at https://phore.io. World Mobile harnesses blockchain technology by streamlining network operations, creating a system that puts privacy and security at the core of everything they do. All interactions with their network are tethered to the blockchain to dramatically reduce network fraud. With lower fraud expenses, they guarantee lower rates to their users. Their trustless network provides complete transparency to their users, allowing them to totally govern what information is shared and who it is shared with. Additionally, all interactions with their network are encrypted, meaning calls, messages and data do not carry the threat that someone might be listening in. Learn more at https://worldmobile.io.